Exploring hermitage and making music, Moon Duo retreat to the rustic confines of Colorado’s backcountry to record their latest space-rock endeavor, Circles. Lending some influence to a Ralph Waldo Emerson poem about nature’s circular path, Circles seeks to tie some common threads between the organic nature of their recording process and the natural world’s repetitious life force. 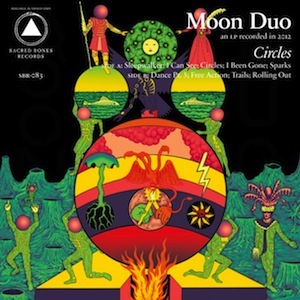 While not as cryptic as Suicide, nor as ambient as some Krautrock artists, the album maintains that kinetic, psychedelic balance always present on a Moon Duo release. “I Been Gone” races right into the darkest mountain recesses with a penetrating guitar flex, repetitious backing keyboards, and plenty of distortion to lift the hairs on the back of your neck. On the other hand, “Trails” is slightly reserved for a Moon Duo tune. We detect a passive reverence for ’60s a.m. radio with the acoustic guitar, melody, and chorus pushed to the forefront, offering a slightly more melancholy direction. While we wouldn’t characterize Circles as a giant leap forward, Moon Duo has allowed areas in their traditional credo to thaw. The Rocky Mountain air hasn’t thinned their pulsating blend of psychedelic rock, but it seems they did find more room in their solitude to explore beyond their boundaries.